Traditional, yet unexpected. 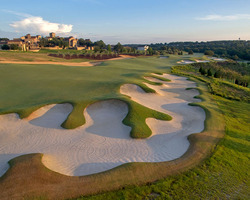 Those words can accurately describe the region of Italy's Tuscany, the Highlands of Florida and now, the unforgettable golf experience at Bella Collina, designed exclusively by Nick Faldo. His creativity and attention to detail that served him well in his playing days, are on display at the private club just north of Orlando. 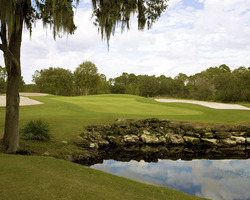 Through clever use of the rolling terrain of the Central Florida Highlands, Faldo has created a traditional-style course that features incredible natural elevations, open fairways, and sweeping dunes. Measuring a stout 7,500 yards from the back tees, Bella Collina features six teeing grounds to ensure players of all levels can enjoy this new masterpiece. All distances lead to ample-size undulating greens that roll fast and true. And from atop one of the highest points on peninsular Florida, Bella Collina's Tuscan-inspired clubhouse will awe you with its incredible beauty and panaramic views reaching miles across Lake Apopka and the Central Florida countryside! El Campeon, "The Champion", was built in 1917, and is one of the south's oldest golf courses. One of two championship courses at The Mission Inn Resort, El Campeon is a hidden gem in the highland countryside just north of Orlando that has formidably stood the test of time. 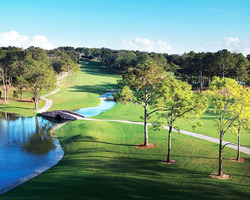 The traditional style course features elevation changes of 85 feet, rolling fairways framed by towering live oaks and sparkling spring-fed lakes. These features, combined with rare Ultra Dwarf Bermuda Grass undulating greens, offers guests a tour-caliber experience. The signature hole is the par-5, 17th, a long, double dogleg that has more obstacles than some entire courses. El Campeon has attained a 4-Star and "Top 25 Resort Course" rating by Golf Digest, in addition to Golf Magazine Silver Medal "Top Resort" and Golf Week "Top 25 Places to Play in Florida" awards. Come stay and play at Mission Inn's oasis of 36 holes that is touched by history and blessed with natural beauty. Las Colinas, "The Hills," opened to a nomination for "Best New Resort Course" by Golf Digest, Top 25 Most Challenging Courses in Central Florida and a recipient of the "Top Fairways" recognition by Golf for Women. This remarkable course offers quite a different challenge from El Campeon. The classic architecture style of wide fairways across gently rolling hills create an inland links design, while the large, undulating TifDwarf greens demand proper shot placement. Las Colinas is a formidable 7,200 yards from the tips with six sets of tees to create the right challenge for all golfers. The signature par 5, 12th hole - deemed "Alligator Alley," - spans nearly 500 yards along one of the tree-lined fairways, requiring absolute accuracy from tee to green.